I was immediatley intrigued by the the blurb of this book. A murder happened on a cruise ship with the killer still amongst the few people on board. That sounded promising. Lo Blacklock is a journalist working for a travel magazine. By accident she gets a ticket to the maiden trip of a new luxury and exclusive cruise ship. But Lo has been attacked in her home by a burglar (a very scary scene). So she is a mess when she arrives at the yacht. In the first night she thinks she witnesses a murder. But she was a bit drunk and as she checks with a crew member the cabin next door nothing is in there. Obviously it is empty. And also there is nobody missing. I have only rated this book with 3 stars. That is because I have quite a few things I did not like about the book. First thing is Lo. She is a whiny and weak character. The author gave her a big package to carry with her panic attacks and the traumatizing burglar experience. She makes Lo thing over and over the same things, everything is repeated twice so that everything is made clear to us readers what’s going on and why Lo is so in distress. That slowed the book down and for me it lacks of suspense until 2/3 of it. At the end things begin to hurry up. There is a big twist I did not see coming. But the story as good as it sounded got more and more unrealistic and unbelievable. I liked the writing, though. And I liked the idea of the story. I felt the same in Ruth Ware’s first book “In A Dark Dark Wood”. But I am afraid she is better in making up stories than elaborating them. The characters also were quite flat. And as I mentioned before Lo went absolutely on my nerves. 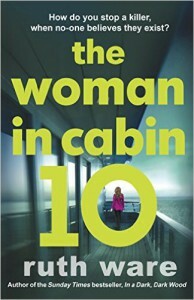 “The Woman in Cabin 10” is a fast read. I liked the idea. But the story is not very realistic and quite a bit over the top. The main character Lo is really a handful and there is way too much explanation which is killing the suspense.